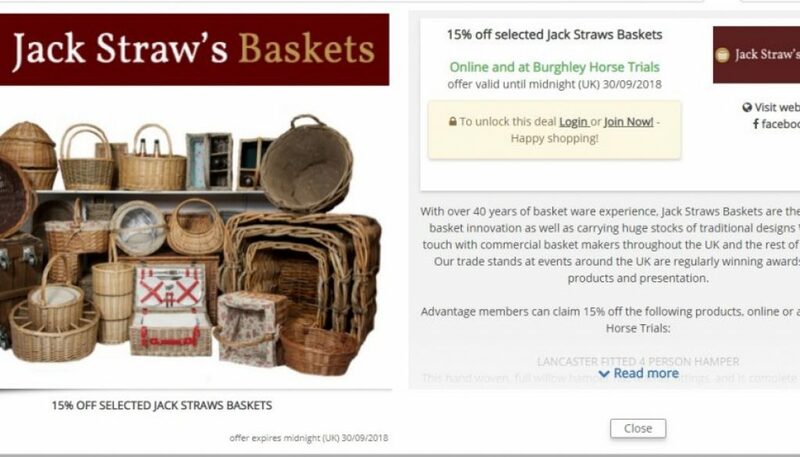 To mark Jack Straws Baskets inclusion at the Burghley Horse Trials we are offering 15% discount at the event. Jack Straws Baskets have won a growing number of awards for our stands at various country fairs, events and shows around the country and we are very pleased that we have been accepted to display our amazing baskets for the first time at the Burghley Horse Trials this weekend. With over 40 years of basket ware experience, Jack Straws Baskets are the leaders in basket innovation as well as carrying huge stocks of traditional designs We are in touch with commercial basket makers throughout the UK and the rest of the world. Our trade stands at events around the UK are regularly winning awards for our products and presentation. Advantage members can claim 15% off the following products, online or at Burghley Horse Trials: To unlock this deal Login or Join Now! – Happy shopping! Please note- this offer expires at midnight (UK) 30/09/2018. Please note that the showground closes at 5.00 pm on Sunday and there is no admittance to Burghley Park after 3.30 pm on this last day. Particularly on Saturday, you are strongly advised to allow an extra hour for the last 10 miles of your journey. The Event is clearly sign-posted. Using satnav, the postcode PE9 3JY will direct you towards Burghley House. Once you see the temporary yellow signs, please follow these and turn off your satnav. Members’ car pass: Gate 1-Pilsgate Lodge on Barnack Road (B1443). Public and season car pass & disabled badge holders: Gate 4-Station Gate (B1443) & Gate 5-Bottle Lodges (B1081). NB The Police or Traffic Management company may be required to redirect you to another entrance. The Traffic Management outside of Burghley Park is within the authority of the Police.